Welcome and thank you for taking the time to visit our new website. As you navigate our new site, we hope it will bring insight into our dedication of service to the public. The Scotts Valley Fire District has a long history of proudly serving our community. That essence of pride continues as we move forward into the future. The personnel of the Scotts Valley Fire District are here to serve you and our workforce is committed to providing the highest levels of service possible to the citizens and visitors. Being an “All Risk” agency, we respond to the needs of the community regardless of the nature of the incident. Our staff is highly trained in all aspects of emergency response, including Advanced Life Support Paramedics. We are dedicated to meeting the continued demands as our communities grow and prosper. I am exceptionally humbled and honored to work with the men and women of the Scotts Valley Fire Protection District that are dedicated and continually strive to provide a better service to you. Our firefighters, Fire Prevention Captain and administrative staff are here to serve your needs. As we look towards the future, we will continue to endeavor to be adaptable and responsive to the needs of the community. As your Fire Chief, I will continue to embody our core values, ethics and collaborative culture that this excellent organization was built upon. We stand committed to assist you at any time with professionalism, respect and compassion. Thank you for allowing us to serve you. Chief Kovacs has over 37 years in the fire service, starting in 1981 with the Ebbetts Pass Fire District, where he stayed for 31 years and reached the rank of Battalion Chief. Concurrently, he moved to Murphys in 1990 and joined the Murphys Fire Protection District as a volunteer. 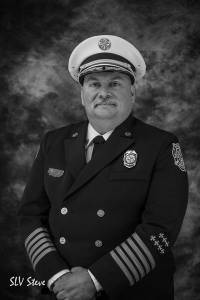 Working his way through the ranks and being promoted to Fire Chief in February 2006, he served until August 2017, for a total of 27 years with the Murphys Fire Protection District. In August 2017, he became the Fire Chief for the Scotts Valley Fire Protection District and Branciforte Fire Protection District. He spent eight years on a CalFire Incident Management Team as a Resource and Demob Unit Leader and is a qualified Division/Group Supervisor, Strike Team Leader, Task Force Leader and Incident Commander Type 3. Chief Kovacs has served on many Statewide Boards and Committees dealing with fire and emergency preparedness, including Fire District’s Association of California and the FDAC Employee Benefit Authority JPA, FIRESCOPE, State Board of Fire Services, California Fire Assistance Agreement Committee and is the Past President of the Fire District’s Association of California. He is also a member of the California Fire Chief’s Association, International Association of Fire Chiefs, and the Volunteer and Combination Officer’s Section. He has also taught numerous fire service classes throughout the United States for the last 28 years, specializing in Strategic Planning, Command, Leadership, Management and Ethical Behavior.